Please note: It is advisable to test on an inconspicuous area first, to ensure fabric is colourfast dyed. Never use pressure washers on soft tops. Dry brush the soft top to remove any residual dirt. Dampen surface of Soft Top with a mist spray of water or a damp sponge. Shake bottle well prior to removing top. Apply with a clean 5cm/2" paint brush using even brush strokes. Start at the centre of the cover working out towards the edge. Leave for 10-20 minutes to ensure the cleaner can work on difficult grime and stains. Commence scrubbing using warm water and a sponge, cloth or bristle brush until the cleaner begins to lather and dirt is being removed easily. Finish by rinsing off with water. Repeat the whole process if necessary. For heavily-soiled surfaces leave the solution to dry for approximately 60 minutes - the optimum time for active ingredients to work. Heavily-soiled surfaces should be scrubbed with a bristle brush. Finish by rinsing off with water. Repeat the whole process if necessary. 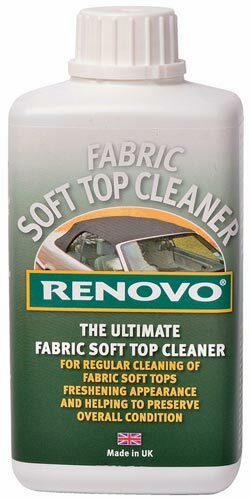 Finally leave to dry before applying Renovo’s Ultra Proofer which will not only re-establish the original 'as new' waterproof weather barrier on your canvas, double-duck or mohair convertible top, also now contains UV protection and a mould/mildew growth inhibitor. Dab or pour the Cleaner directly onto the spot of dirt or stain. (Massage into the affected area) Clean off after 30 mins. Repeat process if necessary. For less soiled tops cleaning can commence immediately. Pour directly onto on to a cloth or sponge and massage into the affected area. Rinse off with water. As with all cleaning products, it is best to avoid prolonged contact with skin. It is advised to use rubber gloves for protection.